Bluewater Cruising Yachts - the local company of craftsmen that built our beautiful sailing yacht Southern Belle - have just produced a video which shows our lovely lady sailing in full flight. 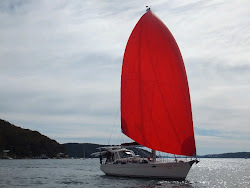 The red sail is our MPS - multi purpose sail - a bit of a cross between a spinnaker and a full head sail. In the video, Southern Belle is the red trim boat (ahem-the one with Southern Belle written on the hull). The other boat was just launched late this year. Have a look at our pride and joy!